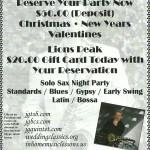 « WANT TO TAKE YOUR PLAYING AND OR JAZZ COMPOSING SKILL TO THE NEXT LEVEL? 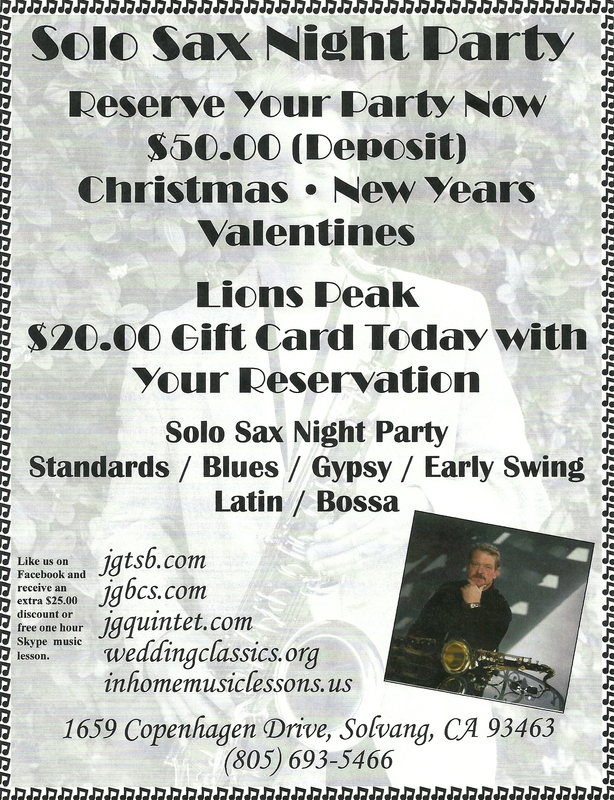 a $20.00 gift card for the ” Lions peak tasting room.” All you need to do is 1) like us on facebook 2) visit www.jgquintet.com to download simple one page contract sign and send back ( Pda file) and 3) make a deposit safe and secure using paypal. For any questions or concerns just give a call ( phone on web-site) . I have a GREAT Christmas book this Holiday season also some OUTSTANDING Early Swing-Dixieland and Django Reinhardt book. Also a must here GERSHWIN Book.